From 1992 through 2017, the average reading scores for White 4th- and 8th-graders were higher than those of their Black and Hispanic peers; however, some achievement gaps have narrowed over time. For example, the White-Hispanic achievement gap at grade 8 narrowed from 26 points in 1992 to 19 points in 2017. NOTE: Includes public and private schools. Testing accommodations (e.g., extended time, small group testing) for children with disabilities and English language learners were not permitted in 1992 or 1994. The reading scale scores range from 0 to 500. Scale scores for American Indian/Alaska Native students were suppressed in 1992 and 1998 because reporting standards were not met (either there are too few cases for a reliable estimate or the coefficient of variation (CV) is 50 percent or greater). Data on race/ethnicity are based on school reports. Race categories exclude persons of Hispanic ethnicity. At grade 4, the 2017 average reading scores for White (232), Black (206), Hispanic (209), and Asian/Pacific Islander students (239) were not measurably different from the corresponding scores in 2015, but the average score for each group was higher in 2017 than in 1992 (224, 192, 197, and 216, respectively). 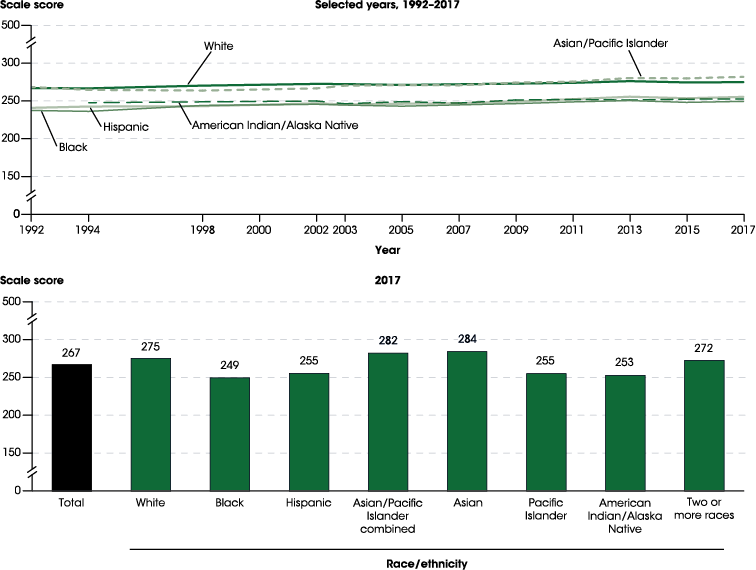 In 2017, the average score for American Indian/Alaska Native 4th-graders (202) was not measurably different from the corresponding scores in 2015 and 1994 (1994 was the first year data for American Indian/Alaska Native students met reporting standards). In 2011, NAEP began reporting separate data for Asian students, Pacific Islander students, and students of Two or more races.3 At grade 4, the 2017 average reading scores for Pacific Islander students (212) and students of Two or more races (227) were not measurably different from the corresponding scores in 2015 and 2011. The 2017 average reading score for Asian students (241) was not measurably different from the corresponding score in 2015, but it was higher than the corresponding score in 2011 (236). At grade 4 in 2017, White students scored 30 points higher than American Indian/Alaska Native students, 26 points higher than Blacks students, 23 points higher than Hispanic students, 20 points higher than Pacific Islander students, and 5 points higher than students of Two or more races. Asian students scored 9 points higher than White students. Closing achievement gaps is a goal among education policymakers. Between 1992 and 2017, the average reading score for White 4th-graders was higher than the scores for their Black and Hispanic peers in each assessment year. However, the White-Black gap narrowed from 32 points in 1992 to 26 points in 2017. The White-Hispanic gap in 2017 (23 points) was not measurably different from the corresponding gap in 1992. The White-Black and White-Hispanic gaps in 2017 were not measurably different from the corresponding gaps in 2015. NOTE: Includes public and private schools. The reading scale scores range from 0 to 500. Testing accommodations (e.g., extended time, small group testing) for children with disabilities and English language learners were not permitted in 1992 or 1994. Scale scores for American Indian/Alaska Native students were suppressed in 1992 and 1998 because reporting standards were not met (either there are too few cases for a reliable estimate or the coefficient of variation (CV) is 50 percent or greater). Data on race/ethnicity are based on school reports. Race categories exclude persons of Hispanic ethnicity. Although rounded numbers are displayed, the figures are based on unrounded estimates. At grade 8, the 2017 average reading scores for White (275), Black (249), Hispanic (255), and Asian/Pacific Islander (282) students were not measurably different from the corresponding scores in 2015, but the average score for each group was higher in 2017 than in 1992 (267, 237, 241, and 268, respectively). 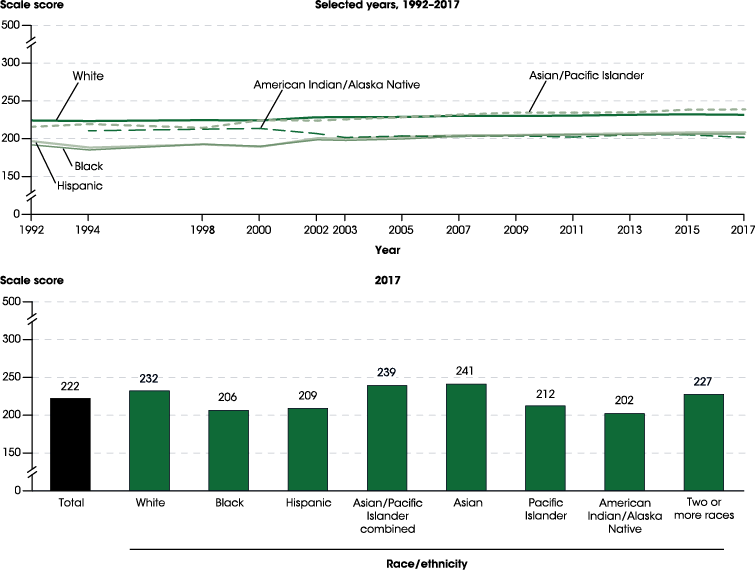 For American Indian/Alaska Native students, the average score in 2017 (253) was not measurably different from the corresponding scores in 2015 and 1994. The average scores for Pacific Islander students (255) and students of Two or more races (272) in 2017 were not measurably different from the corresponding scores in 2015 and 2011. The 2017 average score for Asian students (284) was not measurably different from the corresponding score in 2015, but it was higher than the corresponding score in 2011 (277). At grade 8 in 2017, White students scored 25 points higher than Black students, 22 points higher than American Indian/Alaska Native students, 20 points higher than Pacific Islander students, and 19 points higher than Hispanic students. The 2017 average reading score for White students was not measurably different from the score for students of Two or more races. Asian students scored 9 points higher than White students and 11 points higher than students of Two or more races. The White-Hispanic achievement gap narrowed from 26 points in 1992 to 19 points in 2017, while the White-Black gap in 2017 (25 points) was not measurably different from the corresponding gap in 1992. NOTE: Includes public and private schools. The reading scale scores range from 0 to 500. Testing accommodations (e.g., extended time, small group testing) for children with disabilities and English language learners were not permitted in 1992 or 1994. Scale scores for American Indian/Alaska Native students were suppressed in 1992, 1998, and 2002 because reporting standards were not met (either there are too few cases for a reliable estimate or the coefficient of variation (CV) is 50 percent or greater). Data on race/ethnicity are based on school reports. 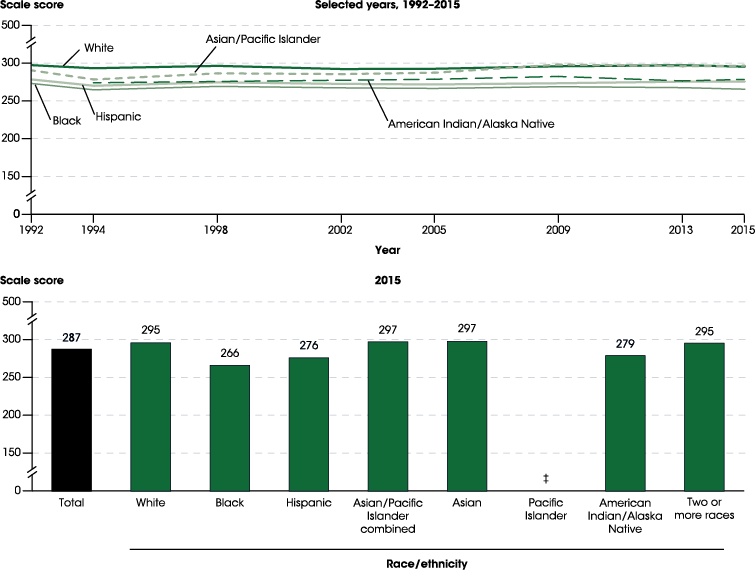 Race categories exclude persons of Hispanic ethnicity. Although rounded numbers are displayed, the figures are based on unrounded estimates. SOURCE: U.S. Department of Education, National Center for Education Statistics, National Assessment of Educational Progress (NAEP), selected years, 1992–2015 Reading Assessments, NAEP Data Explorer. See Digest of Education Statistics 2017, table 221.10. At grade 12, the 2015 average reading scores for White (295) and Hispanic (276) students were not measurably different from the corresponding scores in 2013 and 1992. For Black students, the 2015 average score (266) was lower than the 1992 score (273) but not measurably different from the 2013 score. The 2015 scores were not measurably different from the corresponding 2013 scores for students who were Asian, American Indian/Alaska Native, and of Two or more races. At grade 12 in 2015, White students scored 30 points higher than Black students and 20 points higher than Hispanic students. However, there were no measurable differences between the average reading scores for White students and those for students who were Asian, American Indian/Alaska Native, and of Two or more races. The White-Black achievement gap was wider in 2015 (30 points) than in 1992 (24 points), while the White-Hispanic gap in 2015 (20 points) was not measurably different from the corresponding gap in 1992. 1 This indicator presents data from the Main NAEP reading assessment, which is not directly comparable with the Long-Term Trend NAEP reading assessment. The Main NAEP reading assessment was first administered in 1992 and assesses student performance at grades 4, 8, and 12; the Long-Term Trend NAEP reading assessment was first administered in 1971 and assesses student performance at ages 9, 13, and 17. In addition, the two assessments differ in the content assessed, how often the assessment is administered, and how the results are reported. 2 NAEP reading scores for 4th-grade students in 2017 had a mean of 222 and a standard deviation (SD) of 38. NAEP reading scores for 8th-grade students in 2017 had a mean of 267 and an SD of 36. NAEP reading scores for 12th-grade students in 2015 had a mean of 287 and an SD of 41 (retrieved March 13, 2018, from the Main NAEP Data Explorer, https://nces.ed.gov/nationsreportcard/naepdata/). 3 While NAEP reported some data on students of Two or more races for earlier years, the reporting standards changed in 2011.